Metal: White GoldStyle: PendantLength: 16 - 17.99"
1 ct ROUND CUT Solitaire diamond pendant 14k White gold W/CHAIN K VS2 18 "
Color:K VS2. "Blood" Diamonds Conflict diamonds have funded devastating civil wars in Africa, ending millions of lives. Conflict diamonds, also known as "Blood diamonds". Best Dealz is a part of the Kimberly Process, all our diamonds are conflict free. COMPOSITION: 14K White Gold. DIAMONDS: (6) Natural Round Diamonds Tapering down From 0.10 CaratsTo 0.02 Carats= 0.30 Carats and (32) Natural Round Diamonds 0.02 Carats To0.03 Carats=0.70 Carats For a Total Carat Weight of 1.00 Carats. GENUINE DIAMONDS SI CLARITY RANGE, G-H COLOR. CHAIN INCLUDED. We only use photos of the. 14K WHITE GOLD CHAIN INCLUDED. SI CLARITY, G-H COLOR. Free Ring Resizing. STRIKING 14K WHITE GOLD 1 CARAT T.W. 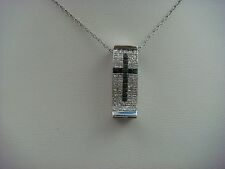 BLACK AND WHITE INVISIBLE SET PRINCESS CUT DIAMONDS CROSS PENDANT, 4.5 GRAMS, 21.6 MM x 7.65 MM. WHITE DIAMONDS SI-CLARITY RANGE, G-H COLOR. Free Ring Resizing. ELEGANT 1 C.T.W PRINCESS CUT AND ROUND CUT DIAMOND'S NECKLACE. The 14K White Gold (stamped). Style: Necklace/ Pendant. Carat Weight: 1.0 ct approx. Total Weight: 5.8 gm. Here we have a beautiful 10k White Gold "A" Initial Diamond Pendant 1.00ct With Black And White Diamonds in a round disc. (including bail). Width: 24.5mm. Thickness: 3.5 mm. Has a sandstone finish under the letter with round cut brilliant diamonds throughout the pendant. TYPE Pendant Necklace. STYLE Heart. STONE Diamond. FINE JEWELRY. WATCHES PARTS. We are constantly adjusting our prices to stay ahead of the competition. SIZE 19.75 x 18.75 mm. BOX/PAPERS No/No. 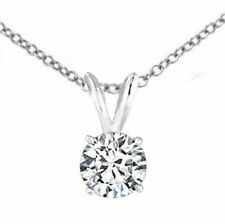 1.15 ct ROUND CUT Solitaire diamond pendant 14k White gold W/CHAIN D VVS1 18 "
Clarity:VVS1 Clarity Enhanced. "Blood" Diamonds Conflict diamonds have funded devastating civil wars in Africa, ending millions of lives. Conflict diamonds, also known as "Blood diamonds". Best Dealz is a part of the Kimberly Process, all our diamonds are conflict free. Metal: White GoldStyle: PendantLength: 18 - 19.99"
1.15 ct ROUND CUT Solitaire diamond pendant 14k White gold W/CHAIN D VVS2 18 "
Clarity:VVS2 Clarity Enhanced. "Blood" Diamonds Conflict diamonds have funded devastating civil wars in Africa, ending millions of lives. Conflict diamonds, also known as "Blood diamonds". Best Dealz is a part of the Kimberly Process, all our diamonds are conflict free. Style: PendantLength: 18 - 19.99"
Metal: White GoldStyle: PendantLength: Less than 13"
•This beautiful pendant is made of solid 14kt white gold and features an open heart design with a spray of diamonds at its center. Together the necklace weighs 6.1 grams. "Blood" Diamonds Conflict diamonds have funded devastating civil wars in Africa, ending millions of lives. Conflict diamonds, also known as "Blood diamonds". Best Dealz is a part of the Kimberly Process, all our diamonds are conflict free. Through the use of ADT (amorphous diamond technology) technology man-made diamond crystals are infused into simulated crystals to create a diamond top that is made of pure carbon SP3 bonds. This adds a thick layer of organized lattice on the surface of these stones and allows them to convey a look and feel that approximates authentic diamonds. Style: PendantLength: 16 - 17.99"
Our diamonds are imported and certified for proof of authenticity of our diamonds. We do have the authority of purchasing any size and shape of diamond as you request even if we do not have it listed, at your request we can provide what you are looking for, any size any shape any color. Featuring 1ctw in Diamonds, this stunning 14k white gold infinity necklace will truly show your infinite love! 1ctw Diamonds. We only use photos of the. Free Ring Resizing. 10 STATIONS 1 CARAT T.W. DIAMONDS BY THE YARD STYLE 14K WHITE GOLD NECKLACE,18"
10 DIAMOND STATIONS NECKLACE. 14K WHITE GOLD. 1 CARAT T.W. SI CLARITY, G-H COLOR. GRAM WEIGHT. WE PROVIDE FREE RING RESIZING. Signature Required Service for security purposes. JEWELRY TYPE. 1.00 ct ROUND CUT Solitaire NATURAL diamond pendant 14k White gold E VS2 18 "
Clarity:VS2 Clarity Enhanced. "Blood" Diamonds Conflict diamonds have funded devastating civil wars in Africa, ending millions of lives. Conflict diamonds, also known as "Blood diamonds". Best Dealz is a part of the Kimberly Process, all our diamonds are conflict free. He is a high school teacher, and a very busy one. A student advocate and one of the best teachers there are in our wonderful state of New York. Most of our pieces are never marked up more than 20%, which is why we can't do the big 50% off sales. Lasts forever just like diamonds. 6 mm long princess cut stone. Flawless stones with perfect color and shine. 6 mm width of the square stone. Looking forward to be your forever personal jeweler. Much more beautiful and brilliant than pics. Free Ring Resizing. within the United States. We only use photos of the. 1 CARAT T.W. "DIAMONDS BY THE YARD" 5 STATIONS NECKLAC. Free Ring Resizing. within the United States. GENUINE DIAMONDS SI1 CLARITY, G-H COLOR, EXCELLENT CUT. Free Ring Resizing. within the United States. We only use photos of the. 14 WHITE GOLD, 0.75CT RUBY & GENUINE DIAMONDS HALO DESIGN PENDANT, 1.05 CT T.W. 14 WHITE GOLD, 0.75CT RUBY & GENUINE DIAMONDS HALO DESIGN PENDANT, 1.05 CT T.W.OVAL SHAPED RUBY APPROX. 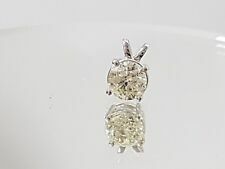 0.75 CT, GENUINE DIAMONDS SET IN HALO DESIGN, APPROX. 0.30 CT T.W. 16.6 x 9.6 MM. Free Ring Resizing. GENUINE ROUND-BRILLIANT CUT DIAMONDS SI-CLARITY G-H COLOR. Free Ring Resizing. within the United States. We only use photos of the. Free Ring Resizing. We only use photos of the. 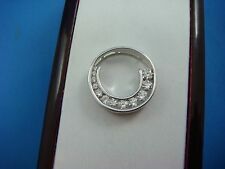 Style: GraduatedLength: 18 - 19.99"
GENUINE DIAMONDS SI-CLARITY G-H COLOR. Free Ring Resizing. within the United States. We only use photos of the. Within the United States. Free Ring Resizing. Diamond Authentication Certificate Included. We are glad to help you with all your queries with in 24 hrs. Indian Ethnic Necklace. Pave Diamond Bangle. Polki Diamond Bangle. Diamond Wedding Bangle. Diamond Palm Bracelet. Diamond Clasp and Lock. Pave Diamond Bead Ball. Rose Cut Diamond Bead. COMFORT FIT 5 STATIONS 1 CT "DIAMONDS BY THE YARD" 14K WHITE GOLD NECKLACE 18"
GENUINE DIAMOND SI-CLARITY G-H COLOR. Free Ring Resizing. We only use photos of the. within the United States. GENUINE DIAMONDS SI CLARITY, G-H COLOR, EXCELLENT CUT. Free Ring Resizing. within the United States. We only use photos of the.